Ling & Ting are twins. They share a birthday. They bake cakes, and they make birthday wishes. They tell stories and wrap gifts. They also share a birthday secret! The simple text and colorful art makes this early reader a perfect choice for children learning to read. Grace Lin is the New York Times bestselling author and illustrator of Where the Mountain Meets the Moon and Starry River of the Sky, the Geisel Honor book Ling & Ting: Not Exactly the Same!, and the beloved The Year of the Dog, among others. She lives in Massachusetts. You can visit her at www.gracelin.com. 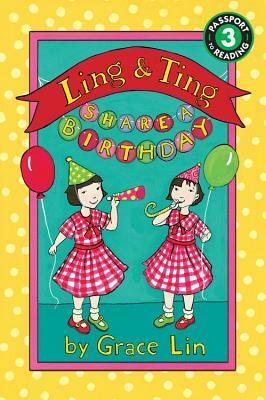 *"The girls' differing personalities and sisterly affection continue to shine...Once again Lin's richly colored gouache artwork, based on 1950s children's textbook illustrations, gives reason enough to celebrate. Tw-inspiring fiction for beginning readers."